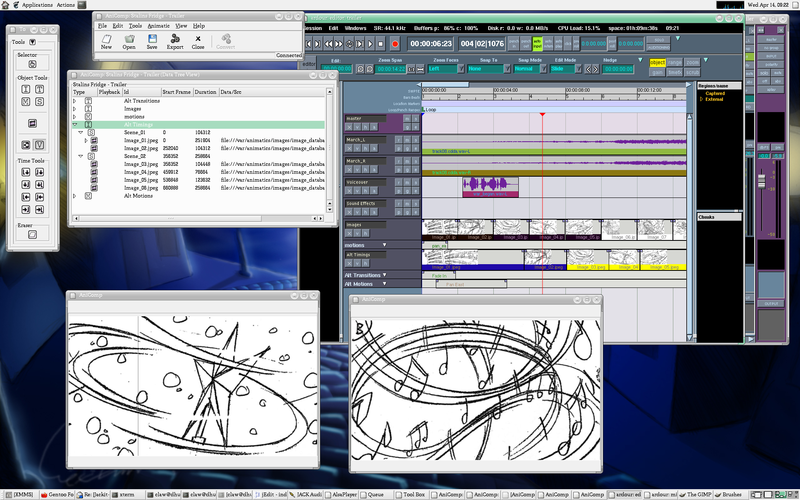 ardour - the new digital audio workstation - includes rudimentary support to display video-timelines. - For this to work the video-data needs to be supplied by a 3rd-party application via TCP-socket, hence the name: Image Compositor Socket. Back in 2004/2005 aniComp from the CMT, Glasgow Animatics-server was supported in Ardour-0.99; but since then ardour-2.X ICS code has been mostly unmaintained. I took to code a video-server that implements the ICS protocol to communicate with ardour and manages EDL video-sessions. This wiki page documents information regarding interoperability and interaction with ardour. ardour-0.99.3 works just fine. However the 2.0-ongoing branch (currently ardour-2.5, svn rev. 3617) introduces video-display regressions that require patching: You can grab split-patches and follow discussion at http://tracker.ardour.org/view.php?id=2364 or download a combined patch from here. I've added it below the “AddTrackBus” entry. Launch the socket-server, ardour and activate ardour's “connect” menu-entry. ICS communicates via TCP port 30000. The general syntax is in ASCII text: Every message but the raw-video-data is encoded as Text, integers are represented as decimal values. REPLY   := "RT0" | "RT1"
# create new video-track "TTTT"
# rename "TTTT" to "NAME"
# expect "RT1" from ardour. Note: ardour-0.99.3 expects SPP=4 and RGBA image data. The patched ardour2 can handle RGB24 and RGBA32.